DOJ Ferguson civil rights investigation: How Obama will will use the report to force reforms at the Ferguson Police Department. 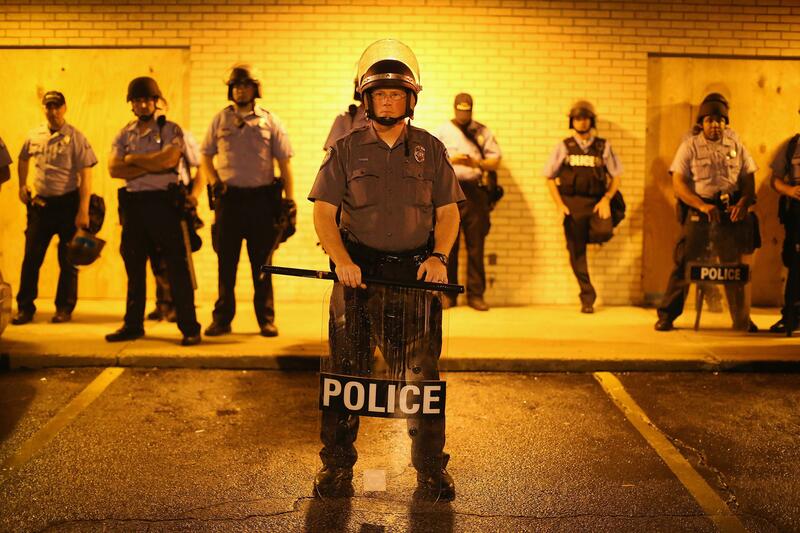 Police stand guard before the mandatory midnight curfew on Aug. 16, 2014, in Ferguson, Missouri. The Justice Department is reportedly putting the finishing touches on the parallel investigations it launched in the wake of 18-year-old Michael Brown’s shooting death in Ferguson, Missouri, this past summer. The results of the first of those investigations—into whether civil rights charges should be filed against Darren Wilson, the officer who killed Brown—is largely a formality at this point. That was always going to be a long shot, and law enforcement officials have already signaled that charges are unlikely. Blacks accounted for 86 percent of traffic stops in 2013 but make up 63 percent of the population, according to the most recent data published by the Missouri attorney general. And once they were stopped, black drivers were twice as likely to be searched, even though searches of white drivers were more likely to turn up contraband. For people in Ferguson who cannot afford to pay their tickets, routine traffic stops can become yearslong ordeals, with repeated imprisonments because of mounting fines. Such fines are the city’s second-largest source of revenue after sales tax. Federal investigators say that has provided a financial incentive to continue law enforcement policies that unfairly target African-Americans. The release of the DOJ report is only a first step toward fixing the police department—but it’s nonetheless a crucial one. Assuming Holder does indeed conclude that there was a pattern of misconduct by the Ferguson PD, the report will give President Obama the ability to force widespread reforms within the department with the help of a law passed in the wake of the Rodney King beating. As I explained this past summer, the law in question effectively leaves the city of Ferguson with two options: 1) Local officials can either enter into what is known as a “consent decree” with the feds that would mandate a specific set of reforms that would then be overseen by an independent court-appointed monitor, or 2) The city can refuse and instead face an almost certain federal civil rights lawsuit. To get an idea of what such a consent decree might look like, I spoke with Samuel Walker, the emeritus professor of criminal justice at the University of Nebraska at Omaha, this past summer. Each settlement is unique, but generally speaking they last a minimum of five years and ensure that the reform process is a public one. The agreed-upon reforms have historically covered three main areas, according to Walker: overhauling of the department’s use-of-force policies, including how such incidents are investigated internally; enacting an early-intervention system that relies on a variety of data, ranging from citizen complaints against an officer to the demographics of his or her traffic stops; and creating a clear, open process through which citizens can lodge complaints when they feel they’ve been mistreated. In the past two decades, more than 20 cities have entered into such agreements with the federal government—both big cities like Los Angeles and New Orleans and smaller ones closer in size to Ferguson, like East Haven, Connecticut, and Steubenville, Ohio. While the results are mixed, there is precedent for significant reforms. The best-documented example of such an effort succeeding is, somewhat remarkably, in Los Angeles, where the beating of King by police helped prompt passage of the federal law in the first place. For more on the upcoming report, check out the Times article. For more on consent decrees, check out my piece from this past summer.